Today we continue our Words From Our Founders series examining our Founding Fathers’ own words on religion, religious liberty, and morality. In honor of Thanksgiving, below is a proclamation issued by the Continental Congress on October 18, 1780. The proclamation establishes December 7, 1780, as a day of “public thanksgiving and prayer.” The proclamation also makes a reference to Benedict Arnold’s treason, which was exposed before it could be fully executed. 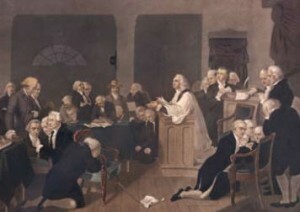 It is therefore recommended to the several states to set apart Thursday, the seventh day of December next, to be observed as a day of public thanksgiving and prayer; that all the people may assemble on that day to celebrate the praises of our Divine Benefactor; to confess our unworthiness of the least of his favours, and to offer our fervent supplications to the God of all grace; that it may please him to pardon our heinous transgressions and incline our hearts for the future to keep all his laws that it may please him still to afford us the blessing of health; to comfort and relieve our brethren who are any wise afflicted or distressed; to smile upon our husbandry and trade and establish the work of our hands; to direct our publick councils, and lead our forces, by land and sea, to victory; to take our illustrious ally under his special protection, and favor our joint councils and exertions for the establishment of speedy and permanent peace; to cherish all schools and seminaries of education, build up his churches in their most holy faith and to cause the knowledge of Christianity to spread over all the earth. Done in Congress, the lath day of October, 1780, and in the fifth year of the independence of the United States of America.